Three years ago I reviewed a Fukubukuro bag from Yunomi. I decided to treat myself and buy another this year. Before I get into the grand opening let me explain a few basic details on what a Fukubukuro bag is. Fukubukuro is a Japanese New Year custom in which grab bags are filled with unknown items and sold at a discount price. Not an alien custom over here, as I’ve purchased mystery makeup bags before, different items but the premise is the same. Well in Japan many shops have fukubukuro bags to attract customers. Fuku means good fortune or luck and fukuro means bag. The f of fukuro is changed to a b to make bukuro due to rendaku…which I think is basically down to the way the words are spoken, in such a form of Japanese grammar. Again, I am not an expert so I may not understand about rendaku; I’m just an early learner in terms of Japanese. But well that covers the basics. As a side note I know that some people reading this may not be familiar with Japanese tea, so I will be taking some information from Teapedia to try and give information on each tea. Hopefully this will be helpful to someone, somewhere. And Teapedia can explain a little more eloquently than I can. Yunomi no longer offer the fukubukuro bags but they did a few weeks ago. I bought a bag for $40 with the promise of at least 300g of tea. There were no preference drop downs or any clue as to what I will get, so random is precisely just that. After a few weeks of waiting (it is coming direct from Japan after all) it arrived this morning. Last time the teas were in the box ie nothing special. This time they come in an actual bag! I got so excited seeing the bag, like it was Christmas again. I started to picture these bags in shops around Japan with crowds carefully selecting which one to purchase. Opening the green ribbon bow (as carefully as I could) I slowly emptied the contents before looking directly at them. I received a total of 310g across five different teas. Each one brand new to me and ones that I have not sampled before. Plus a quick spy of the teas individually totalled just over double the retail price I paid, score! The Maehara Tea Farm is a vertically integrated, family-operated farm located in the southern Japanese prefecture of Kagoshima. Their fukamushicha is a green tea that has been steamed for longer than usual (“deep-steamed”) to create an opaque, deep green, richly flavorful tea, though the leaves themselves are broken apart as a result of the long steaming time. Some information on Fukamushicha. It literally means “deep steamed tea”. For this tea is a particularly special steaming method used. Common Japanese tea is steamed about 30 seconds while Fukamushicha is about 120 seconds steamed. The intense steaming dissolve the tea into small pieces and results in a rich, green color when steeping. Because of the long and strong steaming it is recommended to use a lower water temperature and shorter steeping time when infusing Fukamushicha. – Taken from Teapedia. Beautiful colours on the packaging, that’s the plus side to many Japanese teas. Opening the packet reveals a a sweet, fresh, grassy scent full of vegetal notes. So beautiful, like cut grass on a beautiful Spring day. The tea itself is quite dark green (with a few stems present) and loosely broken into quite fine pieces. The pieces look and feel glossy. Once steeped the resulting tea bares a gorgeous, cloudy green glow and smells of toasted sweet grass with a hint of fresh spinach. In flavour this is of medium strength with real mouth feel. One sip coats my entire mouth with flavour. Grass and spinach mixed with vegetal dark green cabbage notes and a lingering umami that becomes slightly dry in the after taste. Yet it’s fresh and very easy to drink. There is some sweetness mixed with a touch of bitterness but they are quite evenly paired. More flavour and with a touch more bitterness though it’s not bitter by any real means. The sweet umami once again fills my mouth with it’s savoury notes. Still dark green cabbage like but also toasted seaweed. Very mineral and ‘green’ tasting. Beautiful all the same. 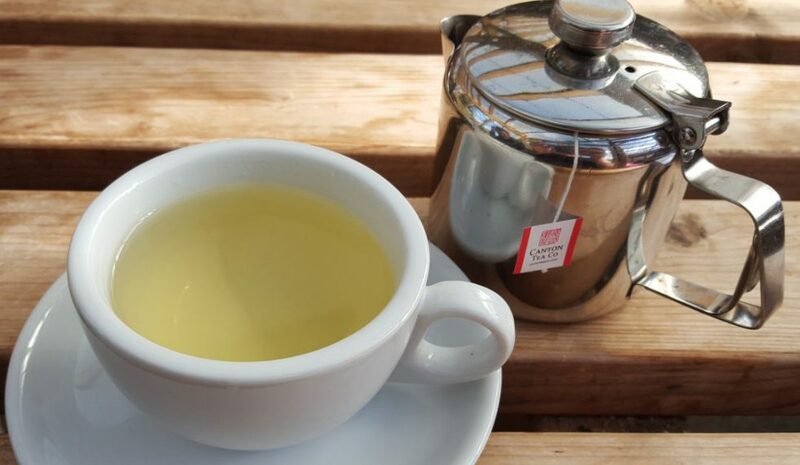 Overall: This was a beautiful green tea that was incredibly easy to drink and very fresh. It was not as umami rich as some other teas but it was pleasing and would be a great tea if you’re interested in introducing yourself to Japanese greens. I have a feeling this would be nice iced. A basic level tencha (spring & summer harvest) made from yabukita tea leaves, this tencha is best used for grinding into culinary or latte grade matcha (the quality depending on how well you can grind it). Alternatively, steep the leaves at 80˚C/176˚F degrees for 2 minutes (5 grams of leaves, 1 cup of water) for a light, sweet green tea. Tencha (碾茶) is a shaded Japanese green tea that is mostly used to make matcha but it’s sometime also used for cooking. Tencha is grown like gyokuro. That means the tea leaves are shaded for about three weeks. That is the reason why matcha got such a vivid green color. After harvest the leaves are briefly steamed and dried but in contrast to most other Japanese teas not rolled. Finally all stems are removed so that only the pure leaves are left. – Taken from Teapedia. Opening this bright green packet reveals a loosely broken mixed green leaf that bares a dry, herbal, toasted grass scent. Once steeped the resulting tea is a deep, cloudy, yellow/green in colour and bares a light yet toasted sweet grass scent. The first sips reveal a toasted, grass flavour (matching of it’s scent) with a touch of astringency and dryness. Good umami notes, sweet and floral with a lingering aftertaste. Only medium strength, not as strong as I had expected considering it’s intense colour. It has a wooden, herbal sort of taste. Similar to the toasted rice in a genmaicha. Overall: Honestly this is not one of my favourites, it’s a little dark and oddly herby for my liking. I prefer tencha in matcha form than in original form. It’s also rather dry. But again this was just a basic grade so I didn’t expect much from it. It’s drinkable by any means but it would not be one I would pick if given the choice. Using Japan grown tea leaves and blended with marigold. Hot: Tea: 1 tsp. Time: 5 minutes. Water: 2 cups, 90C / 194F degrees. I haven’t tried that many flavoured Japanese teas before so this is something of a novelty. All the same I like peach and I’m partial to a Japanese black tea so what could go wrong? Opening the packaging (which is plain but re-sealable) I am met with a super sweet and fruity peach scent. It sent a smile to my face instantly as it fulled my nostrils. It’s so strong and sweet and juicy it’s hard not to want to devour it all on the spot. Steeping Parameters: 5g leaf, 90C water in 200ml Kyusu. Once steeped the resulting tea is brown/red in colour and bares a sweet, peach scent with a wooden under tone. Slurping the first few sips (as you do) reveals medium strength wooden base which lightens and becomes sweet with fresh peach notes in the after taste. It’s balanced wonderfully, it’s not too strong and you can taste both elements equally. The after taste is sweet but also with some dryness. Considering it’s a black tea this is pretty smooth, there is only a hint of astringency. The peach flavour itself tastes natural but the sweetness isn’t, so I believe it must have had something added to it to be so sweet. I can’t say if that is natural or not, it could be stevia for example. Either way it’s sweeter than an actual peach. Rating: It’s a nice flavoured tea. The balance is good, flavours good and my overall drinking experience good. It is perhaps a tad too sweet for my usual liking if I was to be critical. I actually think this would be amazing iced, which is probably how I will steep the rest of this. Black tea smoked with wood from matsu or Japanese pine trees. No flavorings or additives used. Opening the packet reveals a dark brown leaf that is loosely broken and bares a super strong pine smoke scent. Like a smack in the face sort of smokiness. Perhaps on par with Lapsang Souchong. The resulting tea is dark brown/black in colour and bares a smoky pine wood scent similar to it’s raw scent. Flavour is wooden and dry with strong a strong smokiness that quickly dissipates. It’s only medium strength considering it’s strong scent, perhaps a longer steeping time would change that. The smoke has a clinical taste which I believe must be the pine. There is some astringency but it’s easy to drink. The smokiness lingers in the after taste but not as much as the dryness. Overall: It was a pleasant enough smoked black tea, though it has to be said the smoke was perhaps a little too strong for my usual taste. The clinical almost medicinal taste was unusual but interesting. Again I would have to be in the mood to drink this tea. Obukucha from the Miyano Tea Factory is a celebratory green tea with gold flakes attached to separately instead of blended with the leaves. While obukucha usually involves a blending of sencha with dried ume (Japanese plum or apricot) and other ingredients besides gold flakes, this particularly tea is a pure sencha green tea. The gold leaf was separate from the green tea so I decided to use my new washi paper tea canister which was also from Yunomi. I placed both the leaf and the gold inside and gently shook the canister to mix them together. The green leaf is somewhat powdery and bares a strong, creamy and sweet grass scent with hints of seaweed. Similar to matcha. Steeping Parameters: 5g leaf, 80C water, 200ml kyusu. Once steeped the resulting tea is dark green in colour and bares a sweet, grassy scent. Flavour is rather delicate but packed with sweet umami. It’s super creamy and smooth with sweet grass, seaweed and honey notes. It has great mouth feel, one sip coats my entire mouth and the after taste lingers as it becomes sweeter and fresher. Considering the amount of sencha dust this isn’t powdery or dry. It’s a shame none of the gold seems to have made it through my kyusu screen. Though the fact this tea has actual gold in it makes me feel like royalty. Overall: This was delicious and sooo creamy! It has the charm of a matcha but in sencha form. The umami was delicious and a nice balance to the sweet grass notes. I would have liked a little more of a punch in the flavour but overall it was pretty yummy. If you’re interested in Japanese tea then get 20% off your first Yunomi order of $25 or more. Click here. There you have it, my fukubukuro has been revealed and reviewed. I hope you enjoyed this little trip to Japan with me. Thank you for reading. I wish you all some great tea in your near future. Hi, I love this idea of not knowing what your are getting until you actually open up the parcel. I get excited about my lucky dip teas and I know it has to be one of only a few teas. The wait for the parcel to arrive certainly looks well worth it. I think that I would have choosing the smoked black tea first. This is such a cute surprise bag! I’m not such a big fan of tea though (I’d prefer to stick to my usual routine of typical desi chai) but just seeing all these different types of tea was kind of satisfying. I didn’t know all these different types of tea existed! I don’t think I’ve seen as many as green!! a lot of amazing teas in this bag. You were lucky.